HomeShort StoriesStories of LegendsWhat Can We Learn From Dr. A. P. J. Abdul Kalam? For today’s youngsters, keeping the mind free is a difficult task at hand. Today’s world is result and performance oriented. Corporate sectors demand and expect the youth to perform to the best of their ability. For such high expectations, free flow of creativity and a fast processing of thoughts is needed by the brain. But with issues like, performance pressure in entrances examinations, performance expectations from parents, competition among friends, failure of close relationships, and friction of mindsets with parents leads to depression and sometimes even suicidal minds. Most of us today are blessed with the basic necessities of life. But we have started taking many things for granted. Basic things like the comfort of a roof on our heads, financial backing for the good education and other luxuries of life are endowed only to a fraction of the world. In such a case, when success comes it is sweet, but when the same success comes after walking a rocky and a bumpy path of hardships, poverty, struggles and difficulties the victory of success is nothing less of a celebration. You will love to read this Motivational Quote. 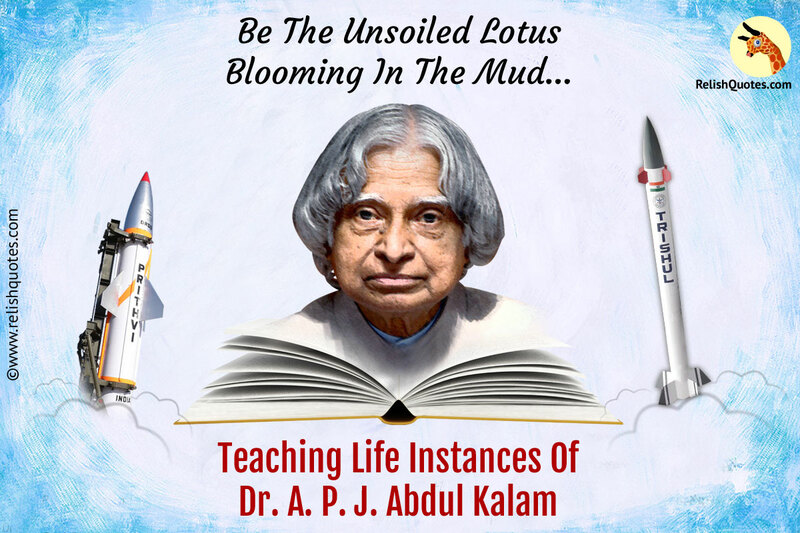 Much close to this situation is that of Avul Pakir Jainulabdeen Abdul Kalam fondly remembered as A. P.J Abdul Kalam. Completion of academics is a very easy task to do when it comes to those who have all the basic necessities available easily but achieving academic heights with scarce resources and on the sole basis of the power of your brain. Born in a poverty-stricken family, son of a ferry owner, The Former President of India used to sell newspapers to add to the family income. Adverse circumstances in life bring out the best in a person, but to face these times in life you got to have inner strength and courage to give life a tough fight! Apart from having a rag to riches story, Dr.A.P.J.Abdul Kalam gave all of us a very important lesson in life which most of us tend to forget to keep in mind. The down to earth your heart is the sky high God will lift you. Bringing India on the global map of Nuclear Power, Dr. A. P. J. Abdul Kalam during a special function at the Raj Bhavan, his “Presidential Guest List” included a Roadside-cobbler and a small eatery owner, to whom he was very close to and used to share meals wit during his struggle days, He reached the highest and most powerful position of the country yet he did not forget people who were by his side in times of distress. Another such incident from, Dr.A.P.J.Abdul Kalam’s life is when he surprised one of his research team officer’s by taking his children to see an exhibition. When Dr.A.P.J.Abdul Kalam came to know that one of his junior team members was busy meeting a crucial deadline and had refused to take his children out to an exhibition, he himself took the personal effort of bringing his junior’s children to the exhibition personally. Being a senior he had a friendly and family like relationship with all of his workmates. He often sent out the personal handwritten card saying thank you, when he liked a gesture by someone. Even from a common man. Another act to have a personal relationship with the common man! Best Inspiring Quote that you should not miss! Dr. A.P.J.Abdul Kalam was a person who easily intermingled with everyone around him and never ever did he show a sign of superiority complex. In fact once while attending a college program he did not sit on a chair on the stage considering the fact that the chair was bigger and grander in size and looks as compared to other chairs. , Dr. A. P. J. Abdul Kalam did not sit on the chair for the meager fact that it was bigger and it made him felt out of the crowd. He sat on a normal chair for he wanted to be just another one among the crowd, literally. Holding the most powerful position in the country, of that of a President, Dr. A. P. J. Abdul Kalam could have earned multimillions of money but, instead all his savings and earnings went to an NGO by the name of Providing urban Amenities to Rural areas. There are endless lessons that we can learn from this small in appearance, but magnanimous in personality, whose pocket to earn money was small but dreams and aspirations concerned with the youth and his country were larger than life. There are no substitutes for hard work, patience, and diligence. Work on the Grass root levels whether it is in relationships or at work. Keep adding constant efforts to improvise on work and in relationships. Its’ time that bosses stop being one! Adding a personal element in your professional relations creates harmony, and thereby employees work wholeheartedly. Turn the pressure of meeting deadlines as a challenge and prove your worth first to yourself. The world will see your worth on its own. No matter what happens, when you reach the pinnacles of success, don’t forget friends and special people in your life who stood by you in you “Making” days and helped you reach the top. Work for the lower strata of society. When you reach a position of helping others get access to people who actually need your help and make genuine efforts to relate to their pain and suffering. Children and youngsters from the future of your nation. Heed their ideas! For their bright minds are superpowers of tomorrow. Make simplicity and humility your assets. Never stop dreaming and working towards them. Turn challenges and deadlines into positive fuels to add to the fire of desire in you. If you have seen struggles in your life and then seen enormous success, do not let the money get to your head. Read More Inspirational & Motivational Quotes for Happiness in Your Life. For, money doesn’t maketh a man, but his values do….